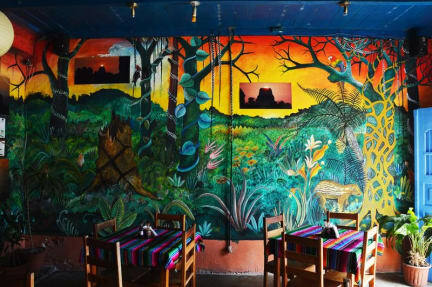 In the heart of Flores, Guatemala, Hostel Yaxha is the place to relax and meet other travellers while visiting Tikal and other Mayan sites nearby. We provide the option of well-priced, very clean dorms and spacious private rooms. All our rooms have hot showers (Flores is a hot place so you can also make them cold), there is an upstairs low key common space, while downstairs in Café Arqueológico Yaxha there is ample seating to unwind after a day of exploring. Have a drink during happy hour and try traditional Mayan dishes from one of the most affordable places to eat in Flores. 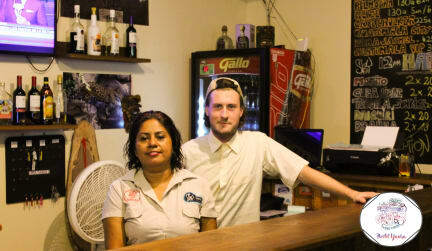 At Hostel Yaxha we also provide access to our specialty tours of Mayan sites in the area, laundry service and free WiFi. We also offer one-on-one, and two-on-one Spanish lessons through our Spanish school Dos Mundos, with options available for full weeks or crash courses. While staying at Hostel Yaxha, you receive a discounted rate at Dos Mundos. If you are looking for a place to go out in Flores, come and check out the best sunset in town from our rooftop night bar and restaurant SKY BAR, where there is a free shot waiting for all Hostel Yaxha guests. We are recommended in all guide-books: Lonely Planet, Rough Guide, Moon, Footprint, Routard, Reise-Know-How, Stefan Loose. WARNING: Don't buy any tickets from coyotes, who get on the bus! Many of them are fake or extremely overpriced. I left my drivers Licence there by mistake but they managed to bring it to Antigua to me. So thanks a lot for that! Hostel itself has a nice common area and nice stuff. It's also clean and has aircon. I really enjoyed my stay at Hostal Yaxha. The atmosphere was really good and it’s just a great place to kick off some adventures. The staff has been super helpful with everything from doing the laundry to booking trips for the rest of our journey. Melky was always there whenever we had questions and helped us big time when we got into some trouble with a local travel agency. He really saved our trip to the jungle and made our stay in Flores worthwhile! Really nice hostel with an amazing bar/roof. I find it a bit expensive compared to the rest of the country, considering that breakfast isn't included either. Hugs to Milky. We came with couple of problems (overbooking amongst others) and the staff helped us with all of it. The staff - especially Melky - and also Glendy at the bar did a great job. 5* for Melky! Would be nice if windows could be opened, however Fans and A/C helped. We booked Tikal Tour via the hostel which was good. All in all we definitely recommend that hostel! Tours are not executed by the owner Dieter Richter anymore but outsourced to another tour company. Nice place, really friendly, helpful relaxed place, rooftop bar with outside beers accepted, nothing too fancy but really relaxed and fitting vibe for this town, really enjoyed staying. Alles sauber & die Mitarbeiter waren freundlich. Keine Klimaanlage, obwohl wir tagsüber teilweise 37 Grad hatten. We stayed in a private double for 3 nights. Rooms are not fancy but big enough. AC worked fine, WiFi did not. Rooftop terrace is really loud if you are sleeping right underneath it. We booked a tour with the reception but unfortunately they told us the wrong departure time. So the tour started without us. That was really annoying. Would not recommend the laundry service. Apart from that, all right hostel, well-located. Mitarbeiter unfreundlich und desinteressiert. Deluxe dorm leider gar nicht Deluxe. Wäscheservice teuer. Nur ein Badezimmer pro 9er dorm, keine separate Dusche. Partybereich nicht isoliert. Lage ist super. Der rooftop ist super schön.